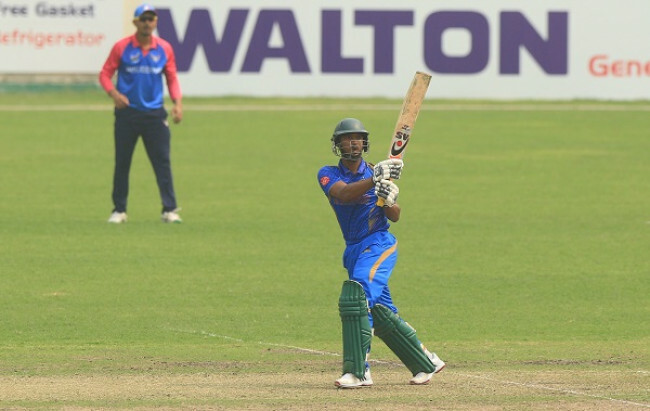 Legends of Rupganj stayed on course of the Dhaka Premier League (DPL) after outclassing Mohammedan Sporting Club by 46 runs in their first match of the Super League phase at BKSP-4 ground on Monday. Skipper Naeem Islam struck a run-a-ball-108 as Rupganj compiled a hefty 313-4 after which their bowlers bowled well in tandem to bundle Mohammedan out for 267 in 46.2 overs. After being defeated at the hands of Prime Bank in their third match in the group phase, it was Rupganj’s ninth consecutive victory in the league which displayed the consistency that they have. Their start was not ideal one after being sent to bat first as Mehedi Marud continued his poor form to be out cheaply. Mominul Haque and Mohammad Naim steadied the innings after which the latter was out on 26. Naeem Islam joined Mominul and the duo added 107-run for the third wicket to lay a platform of big total. Mominul struck eight fours and one six in his 88 ball-78 before he was removed by Mohammad Ashraful. Naeem thereafter shared 121-run with Shahriar Nafees for the fifth wicket, much to the frustration of the Mohammedan bowlers. Nafees was dismissed for 68 off 61. But Naeem remained unscathed and propelled the side past 300, to make the side heavily favourite to win the game. Ashraful was the most successful bowler for Mohammedan with 2-44. Irfan Shukkur and Liton Das started fluently in the chase of big total but once again Liton failed to convert his good start to big one as he was dismissed for 24. Rupganj bowler however kept striking at regular intervals though Shukkur and skipper Raqibul Hasan made resistance to a great extent. Pace bowler Muktar Ali got both of them halfway through the innings to dent Mohammedan’s hope. Shukkur made highest 78 while Raqibul scored 58. Shuvashis Roy finished with 3-56 while Muktar and Mohammad Sahid scalped two apiece.